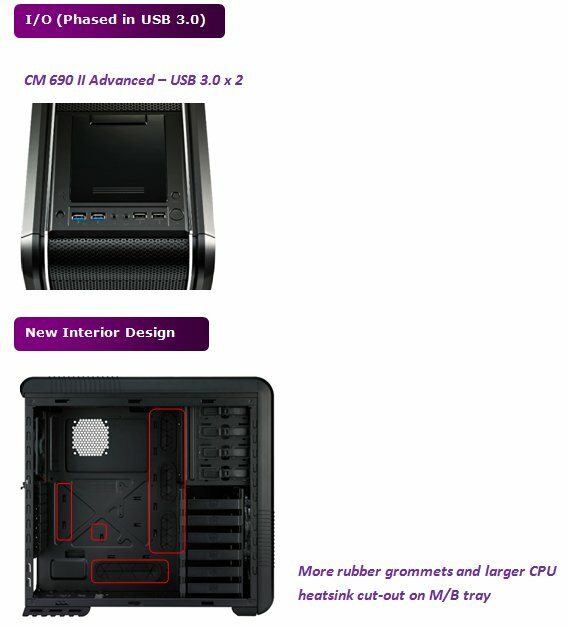 Cooler Master announced an updated CM 690 II Advanced case with USB 3.0 support and a couple of other minor changes. This new model will be available within a couple of days for roughly the same price as its predecessor. Cooler Master, an industry leading chassis, thermal solution, power supply, peripheral, and accessory manufacturer, today announces that it will be improving its best-selling, award-winning CM 690 II models. Time tested as a titan among mid-tower cases, the CM 690 II makes it possible to take advantage of excellent airflow and water cooling options to vastly reduce temperatures on system components. The roomy interior space of CM 690 II Advanced enables users to install up to 10 fans, with enlarged mesh design for superb ventilation. Users can accommodate 120x240mm radiator at the top and bottom for superior cooling performance. It also supports up to 2 radiators for water cooling units, and larger CPU cooler, such as Hyper 612 PWM. Keeping the ideal filter design of previous generation, new CM 690 II series is also equipped with filters on all meshed area and bottom for easy maintenance. And with the tool-free 5.25”/ 3.5” HDD bays, the 1.8”/ 2.5” HDD and SSD adapter, CM 690 II series can fully fulfills the demand of storage. In addition, CM 690 II Advanced also includes an external SATA dock; users can install HDD here with protection. Utilizing user feedback, Cooler Master engineers improved upon the CM 690 II’s winning design by greatly increasing the CPU mounting hole size to accommodate new Intel Ivy Bridge mounts and AMD rear mounting procedures. Its roomy space can also contain long graphics cards, such as AMD Radeon HD 6990. Additionally, rubber grommets have been added to aid in setting up a clean and professional cable management layout. Loaded with features, the CM 690 II delivers as the ultimate mid-tower for any purpose. With the announcement today, Cooler Master will begin offering improved Advanced and Plus models that will maintain its image with a performance and value update. This is accomplished by implementing the exciting new internal changes and exchanging the e-SATA port for two additional USB 3.0 internal connectors. Next to this, the I/O on the top also offers a more convenient way to access.